This Valentine Heart is the perfect gift for anyone! 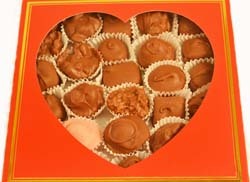 The charming red heart shows the receiver of the gift the perfect chocolates inside. This one contains Dorothy's Deluxe Assortment, which includes a luscious array of premium nut clusters, fancy fruits, creamy caramels and our homemade recipe nut crèmes, all drenched by hand on the premises in our wondrous, Swiss chocolate. From Edie Maharam of Pittsburgh, Pennsylvania on 2/14/2013 . From Anonymous of Amherst, Massachusetts on 2/20/2012 .